Yes, fundraising is indeed an art! As a payroll provider to third sector organisations, we see our clients on a daily basis searching for that elusive philanthropist, nurturing a culture of legacy donations or staging PR extravaganzas to raise public awareness and thus cash for their cause. The employees of your organisation, clients and suppliers are the general public too, so consider promoting your cause 360°. Post-tax salary donations: where employees’ donations are taken directly from their salary after tax has been deducted, is a popular way of raising funds from those who care deeply about your service or end users. It can be possible through creative promotion to throw the net wider to their family and friends too. Every organisation uses essential services and has overheads – but when was the last time these were scrutinized with a fine toothed comb? Costs for outsourcing services such as cleaning, stationery, IT provision, utilities, or even payroll could be open to negotiation or at best haggling or limited time offers. Comparing the markets could reveal great cashback incentives or companies that offer services at reduced fees for charities. But make sure you receive a superior service that also saves you £££’s. 4. Time and Motion is king! It’s not just about reducing the bills or asking for donations. Ask yourself: “Are your service providers demanding too much of your staffs time?”. Are your suppliers systems and processes making it easier for you to sell, distribute or reduce internal processing time? Perhaps, this is an opportunity to take a long hard look at what tasks are unnecessarily arduous for your staff and aim to ensure your employees are working for your organisation not for theirs!. Demand that your service providers do more for their fees and use your staff’s time sheets as evidence to back you up. 5. Reduce, reuse, recycle or renovate! Think laterally – consider ways to reduce in-house expense claims. Don’t put money in the shopkeeper’s hand every time there is a birthday or special occasion in the workplace – as some staff gifts and social events could cost your charity more money than you bargained for! Find a smarter alternative! Instead of a departmental meal out, hold an Auction of Promises or Race Night – Both are great for team building but can also publicly raise the profile of your charity, attract funds for your organisation whilst refocusing your staffs attention via a positive experience. The aim here is to create more than one beneficial outcome!! 6. Tax breaks with added bite! As you know, there are many forms of income which is taxable – but what about promoting tax breaks to your employees? Theory suggests, staff who feel they are receiving helpful assistance from their employer are more likely to build stronger psychological contracts with them and work harder in return! 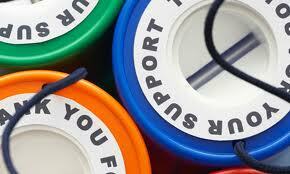 So search out ways to help your staff have more £’s in their pocket and they may return the favour to your cause. For example, employees who are responsible for the purchase, repair, replacement or cleaning of their work uniform can receive tax relief to cover their costs. Capital purchases to enable staff to work from home are also subject to tax relief. Or consider added extras like lunch vouchers or salary sacrifice schemes all of which help to increase your attractiveness as an employer and thus create a culture of belonging, commitment and increased productivity. However, we’re not fundraising gurus, just mere payroll professionals – so for for further advice read the Code of Fundraising Practice . However, we do have the inside knowledge when it comes to payroll, so do contact us on 0117 9328145. We’re happy to help.